Reed Relays are often considered a mundane component by Design Engineers and sometimes little thought is given to the finer points of their specifications. It is easy to see why this may be. It is after all, much more interesting to work with microprocessors etc. or to make your software really sing and ignore this seemingly simple component. Correctly used and specified though, reed relays are very reliable devices, however they can be vulnerable when used incorrectly. Understanding their specifications will help a good Engineer to avoid some of these potential problems and greatly enhance the reliability and performance of his designs. Before moving on to the explanation of the specifications, it is worth briefly examining the effects of temperature, as this can affect the performance of the part. The reed switch is operated by the magnetic field generated by the current flowing through the operating coil, which is wound using copper wire. Copper has a positive coefficient of resistance of approximately 0.4% per °C and its resistance will increase with temperature at this rate. As the resistance increases, the current and therefore the level of magnetic field will fall. Remember that there may be a small voltage drop in the relay driver that should also be taken into account. It can be clearly seen in the graph below, that at higher temperatures, it is possible that the relay will not operate at its nominal coil drive voltage. As well as operate and release voltages, temperature changes can also affect the contact resistance figures or stability if there is less ‘overdrive’ on the reed switch. It can also increase the time that it takes for the switch to operate because the rate of rise of coil current, limited by the inductance of the coil, will be slower to reach the operate point of the reed switch. Main specifications points explained, with some useful tips. The resistance of the operating coil is specified at a particular temperature, usually 25 degrees Centigrade and will vary with changes in temperature as described above. This is the nominal d.c. voltage that should be applied to the coil in order to operate the reed switch correctly when used within the devices specified temperature range. It is sometimes possible to use a relay at a temperature a little higher than its normal range. However, the coil voltage would need to be increased slightly to accommodate the change in resistance. This is because the level of the magnetic field generated is proportional to the coil current. 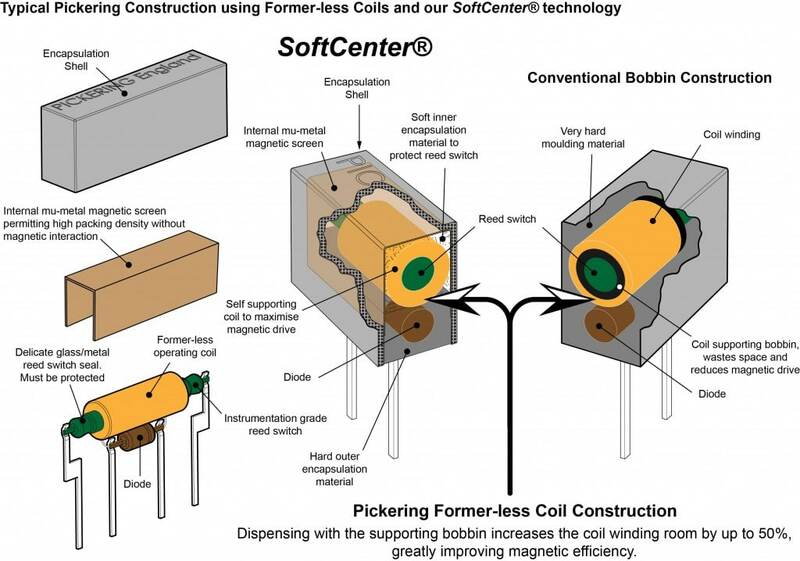 Please contact Pickering Technical Sales for further advice if necessary (techsales@pickeringrelay.com). The voltage by which the switch must operate (contact made, in the case of a Form A, energise to make relay) will not be higher than this figure. Again a temperature will be specified. This figure is usually 75% of the nominal coil voltage and is such that the contact will still operate, with some overdrive, at the specified upper temperature, when operated at its nominal level. The voltage by which the switch must have reverted to its un-operated state as the coil voltage is reduced (contact open, in the case of a Form A, energise to make relay). The voltage will not be lower than this figure which is usually 10% of the nominal coil voltage. This is the maximum initial resistance between the relay switch terminals when the relay is operated at its nominal coil voltage. Only a small part of this figure is actually the resistance of the switch contact, most of this figure is the switch wire and the leadframe on which the relay is constructed. Operate time – Bounce time. The time it takes for the reed switch to operate is determined by the rate of rise of the magnetic field and is limited by the coil inductance and the inertia of the reed switch blades due to their mass and compliance. When a dry reed switch contact first makes, there will be a period when the contact bounces a few times before settling. The bounce period of small reed switches is usually 10-50 microseconds depending on type. The operate time is usually specified including bounce when operated at the nominal coil voltage. At high temperatures, the operate time will increase a little due to the increase in coil resistance as described earlier. The release time is the time it takes for a relay contact to open (in the case of a Form A, energize to make relay) after de-energization of the operating coil. Most applications will require the presence of a diode across the coil to protect the relay drive circuit from the back EMF generated by the coil inductance when the coil current is interrupted. If no diode is used or some other protection circuitry is used instead, it is possible to speed up the release time. Typically, when a diode is used, the release time will be around one half of the operate time. This is the maximum current that the relay will switch when the coil is first operated and is usually specified for a resistive load. The most common cause of failure of small reed relays is a weld due to unforeseen current inrushes. 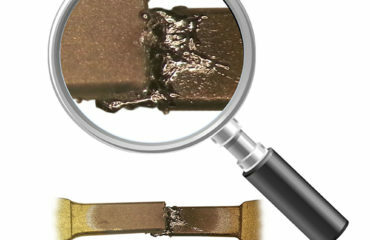 Sometimes a mild weld can be cleared with a small tap but this may have already damaged the contact plating. Even small levels of capacitance can cause high current spikes and although the time constants may be short, they can cause damage, particularly at higher voltages. Back EMFs from switching inductive loads should also be supressed. Carry current is the current that the reed relay can support through its contact if it is applied after the switch is closed and settled. This is usually referred to as ‘cold’ switching. The principal limiting factor for this figure is the heating effect of the current through the resistance of the contact (I2R) but there are other factors also. There is a subtle effect that occurs as the carry current increases – the current creates its own magnetic field that twists the blades and therefore can modulate the contact resistance slightly. It is sometimes possible to carry pulses higher than the carry current figure but the level will depend upon the duration and duty cycle. 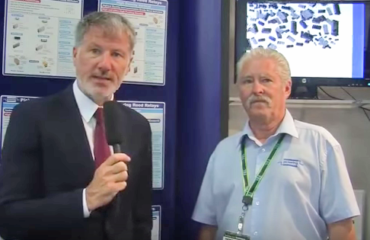 Please contact Pickering Technical Sales for further advice (techsales@pickeringrelay.com). This is the voltage, d.c. or a.c. peak that the relay will switch when the coil is first energised. This is usually for a resistive load. This is the voltage, d.c. or a.c. peak that the relay can withstand across its open contact without breaking down. This is usually specified for high voltage relays and will be a higher figure than the switching voltage. The power rating of the switch in Watts, is the product of the voltage across the open switch at the point of operation and the instantaneous current at the point of switching (VxI). This is normally specified for a resistive load. Unique features of Pickering Reed Relays. Reed switch contacts are enclosed in a glass capsule, in an inert atmosphere or in the case of high voltage switches, a vacuum. This prevents oxidization or contamination of the contact surfaces. The integrity of the delicate glass/metal seal where the wire connections leave the switch capsule is therefore of paramount importance. Most reed relays are moulded within a very hard epoxy package which can sometimes lead to stresses on the switch. 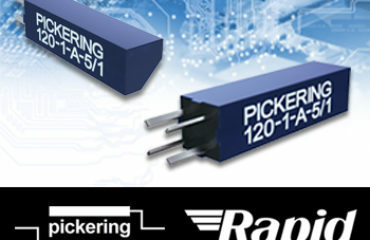 Different materials have different expansion/contraction rates and because of this, Pickering relays are encapsulated using a soft inner material to act as a buffer around the reed switch. This technique improves the reliability and performance of the part. Relay operating coils are usually wound on bobbins. 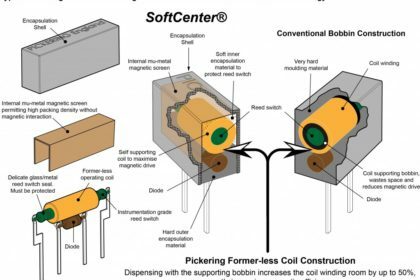 The great majority of Pickering relays are made with self-supporting coils, sometimes called air coils. This avoids the space required for bobbins. In the case of smaller relay types, this gives around 50% more room for the coil winding, allowing the use of less sensitive reed switches with their inherent advantages of higher operating and restoring forces. In some ranges, this technique allows Pickering to achieve extremely high coil resistance figures. Reed switches, are operated by the magnetic field generated by the coil wound around them. In more usual unscreened relays these magnetic fields will also act on the reed relays closely stacked alongside. The polarity of these fields will oppose those in the reed switches of adjacent relays making them less sensitive (see illustration). In some circumstances, this could lead to them not operating at the normal coil voltage. This problem is eliminated when using Pickering Reed Relays as they feature an integral mu-metal magnetic screen. This screen also improves the magnetic efficiency of the package.